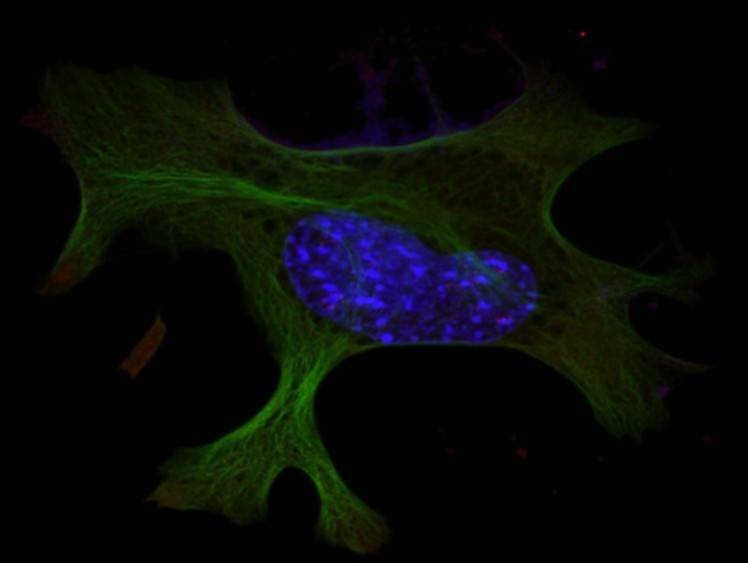 The MSc study entailed investigating the relationship between the neuronal microtubulin cytoskeleton and the protein degradation process called autophagy, a system known to be dysfunctional in Alzheimer’s disease. We sought to elucidate previously unknown molecular events that occur prior to the onset of cell death brought on by induced autophagy dysfunction and in doing so highlight potentially new targets for therapeutic intervention in the treatment of Alzheimer’s disease. IMAGE: Micrograph of a mouse brain cell stained with fluorescent antibodies to visualize the microtubulin cytoskeleton (Green), Spastin (Red) - a protein known to interact with microtubulin and the nucleus (Blue).